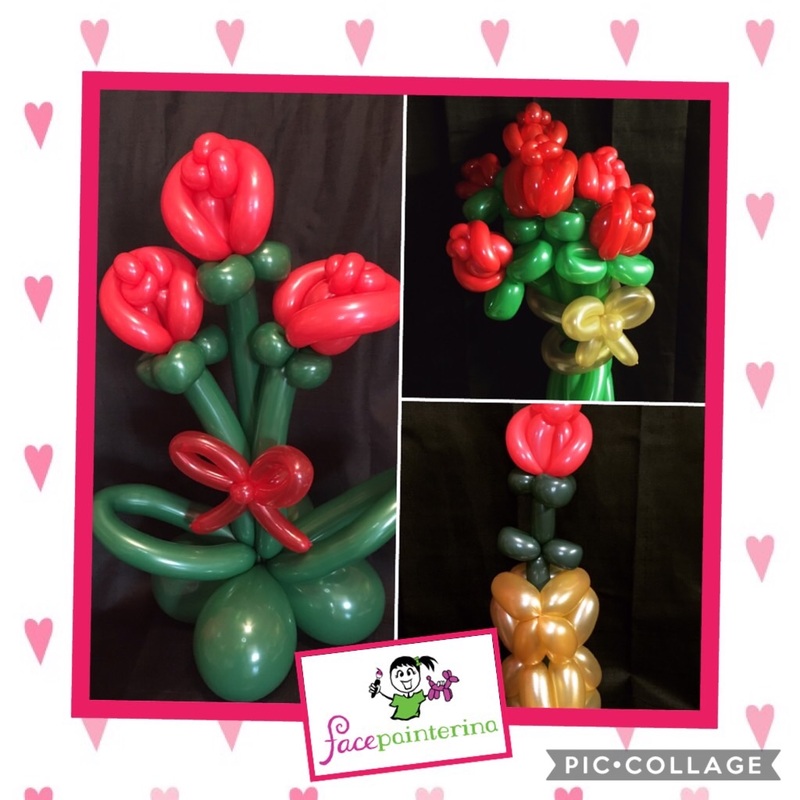 What Can We Make Out of Balloons? 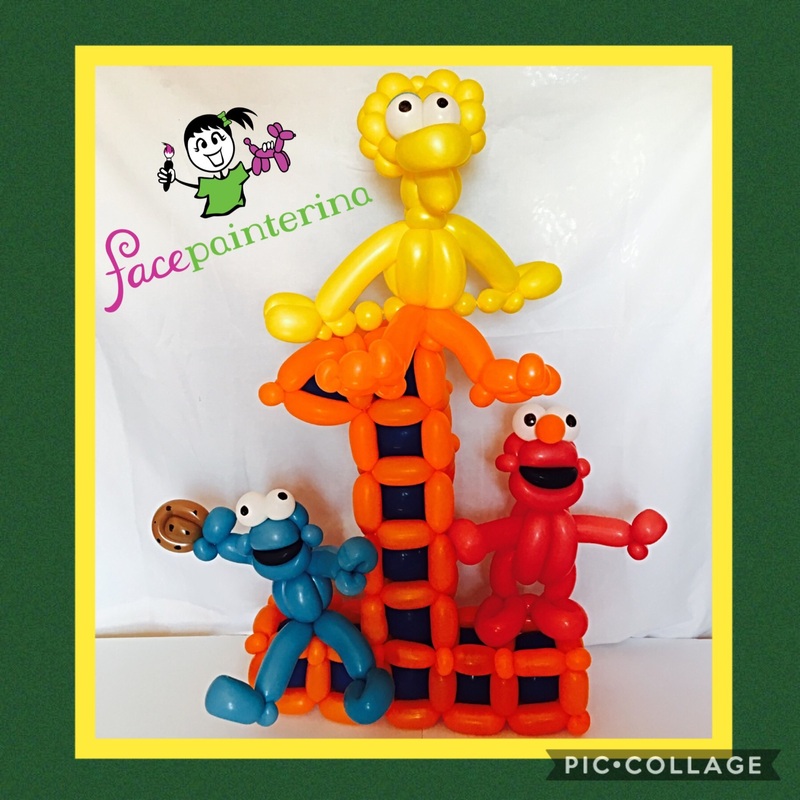 Oh, the places we will go and balloons we will twist! 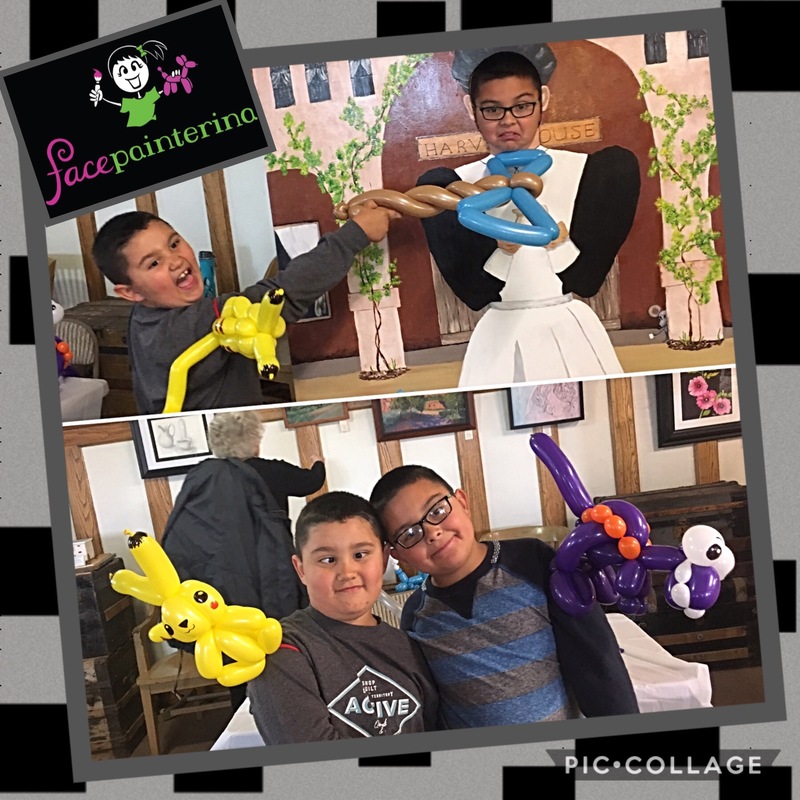 Let us twist at your party, add fun to your list. 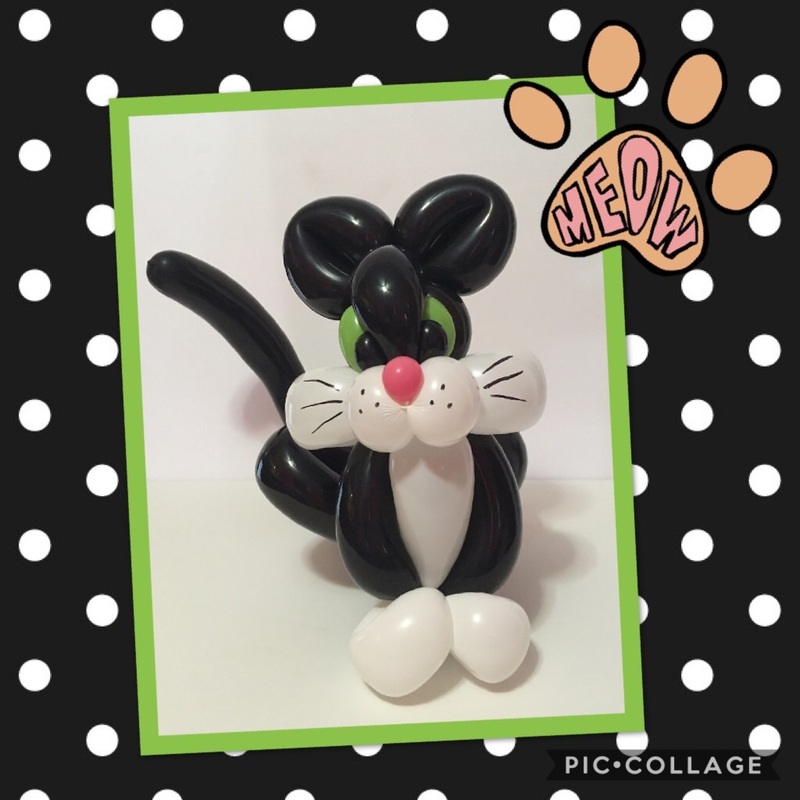 Facepainterina can twist many things, even a cat. 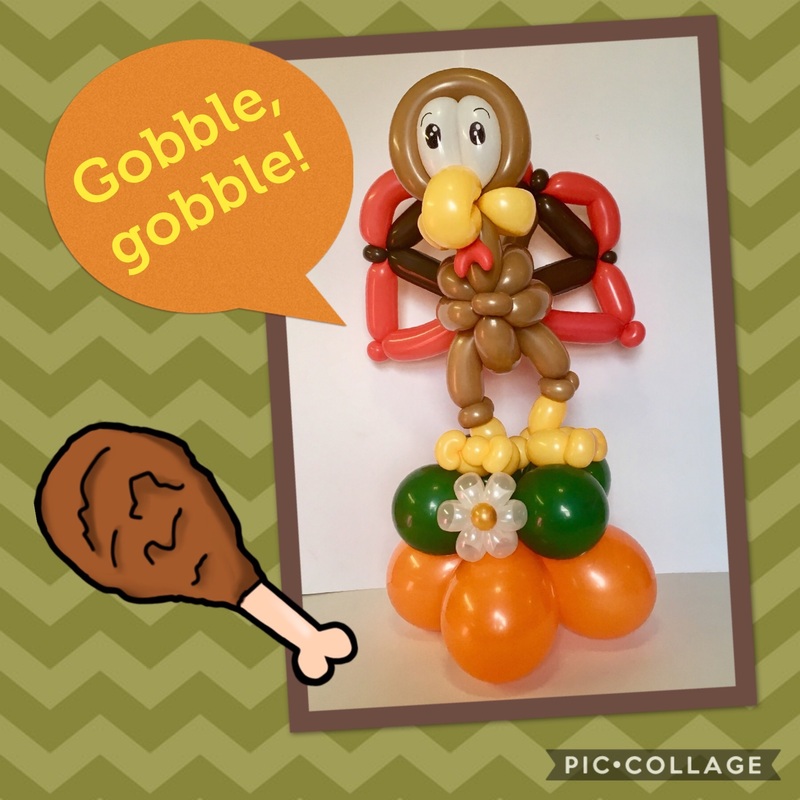 Add on a balloon centerpiece. Now what do you think of that? 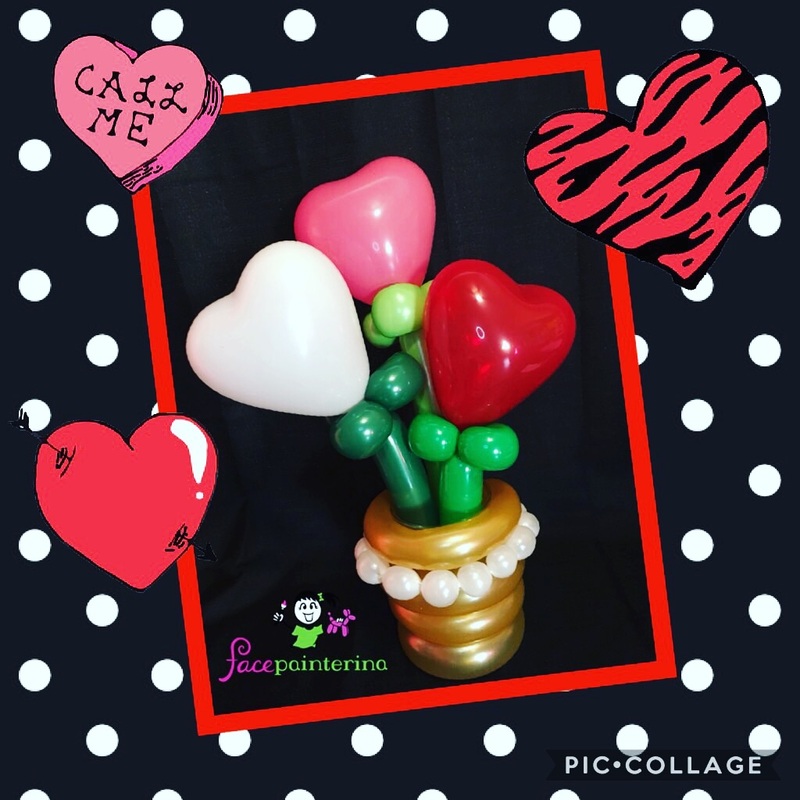 Balloon bouquets are totally hot! 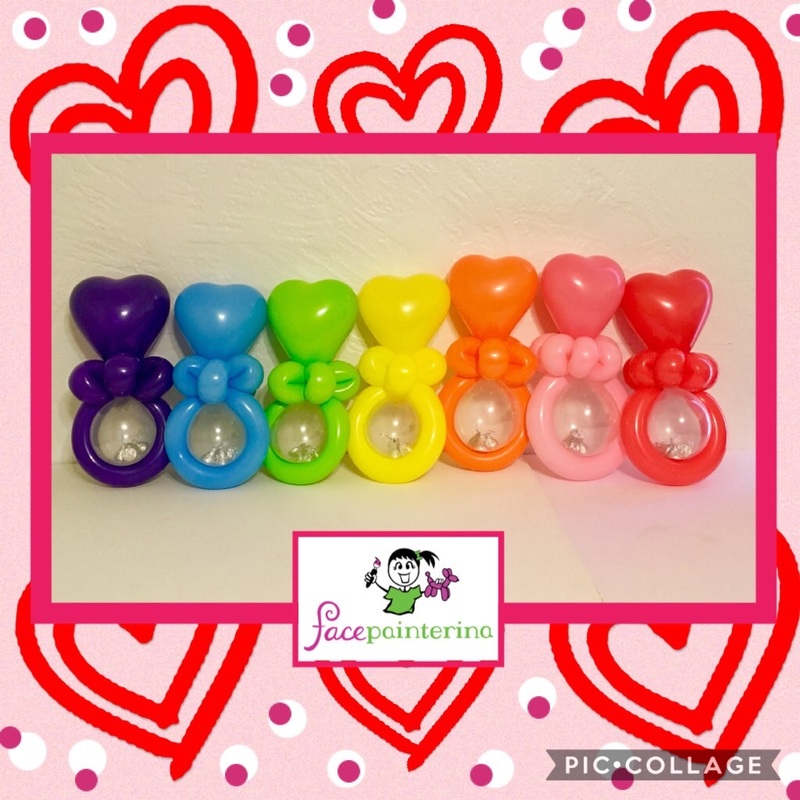 Order some for your loved ones, they will like them a lot! Need a cool and nifty gift? Balloon cups are nifty and swift. They can be stuffed with candy that is sweet and yummy! For that picky teenager, you can stuff them with money! Tired of boring decor? 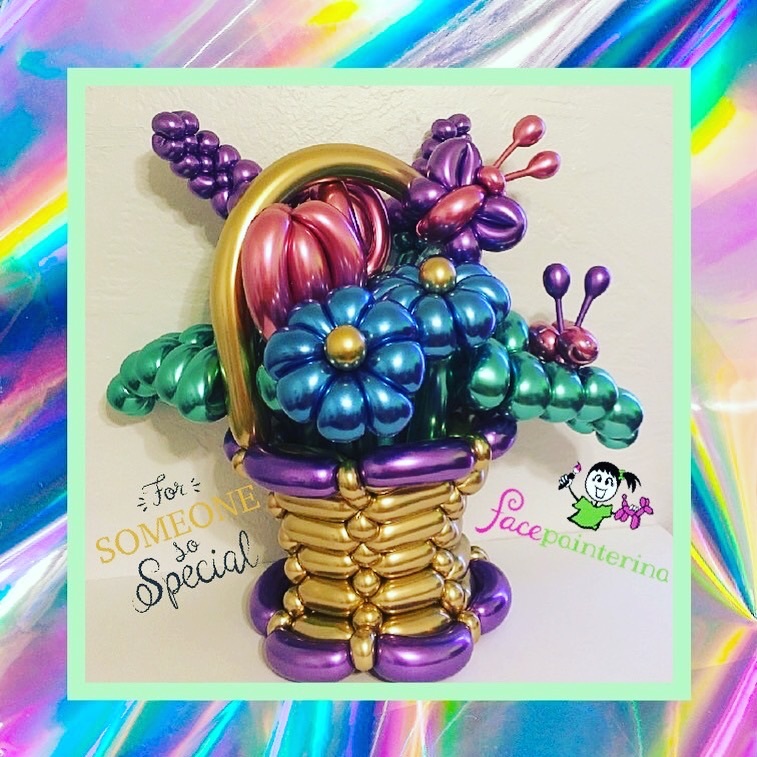 With balloons, decor can be so much more! 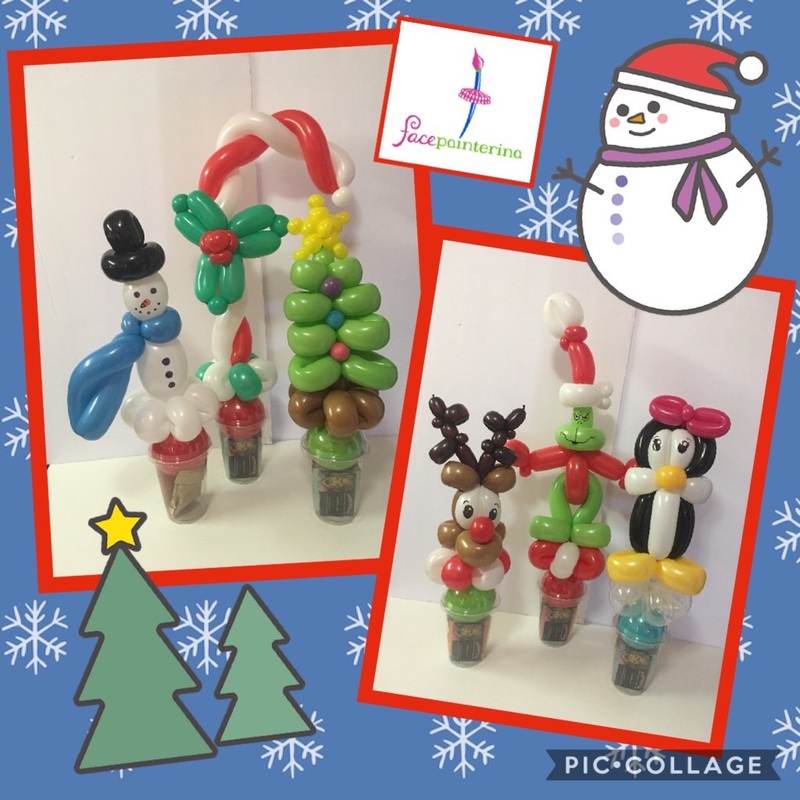 Check out our balloontastic services! 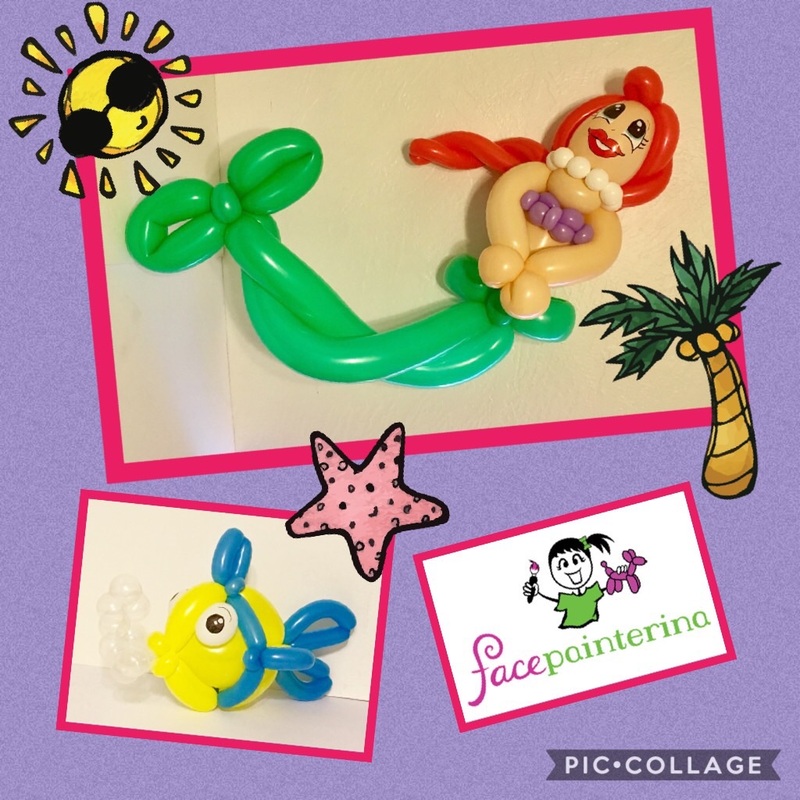 Facepainterina twists simple to detailed balloon designs for parties and events. 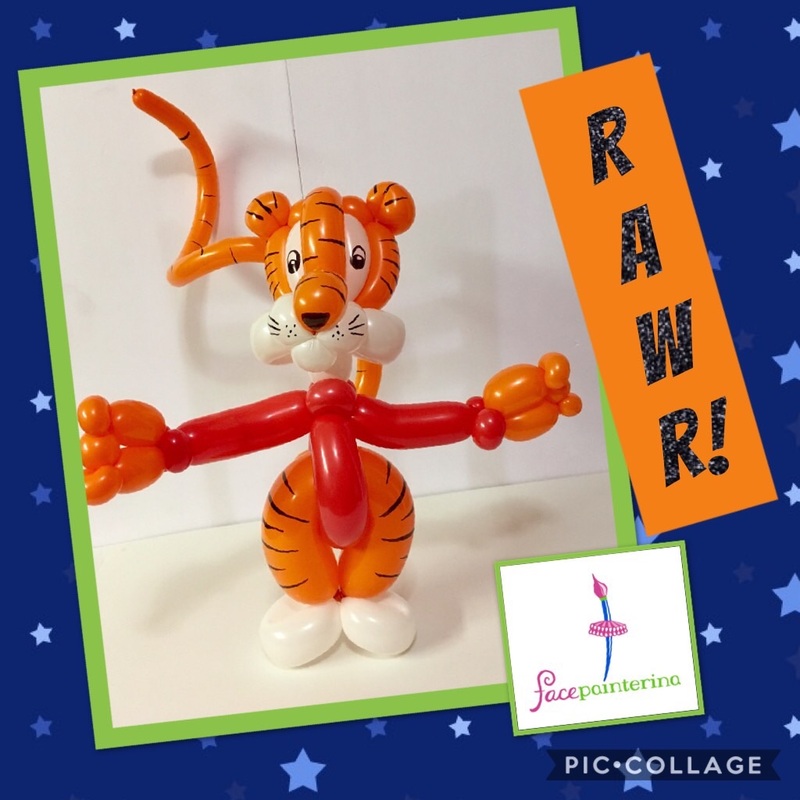 For smaller parties, we can twist 10-15 detailed balloon designs ranging from animals to characters to hats. 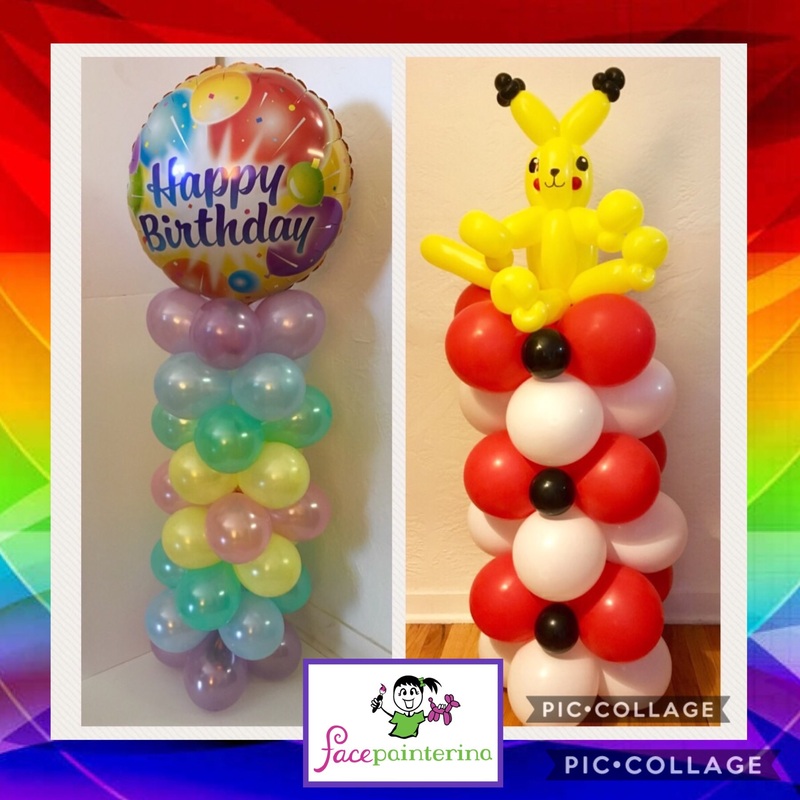 For larger events, we can twist 20-30 basic balloon designs like swords, wands, and one balloon animals. 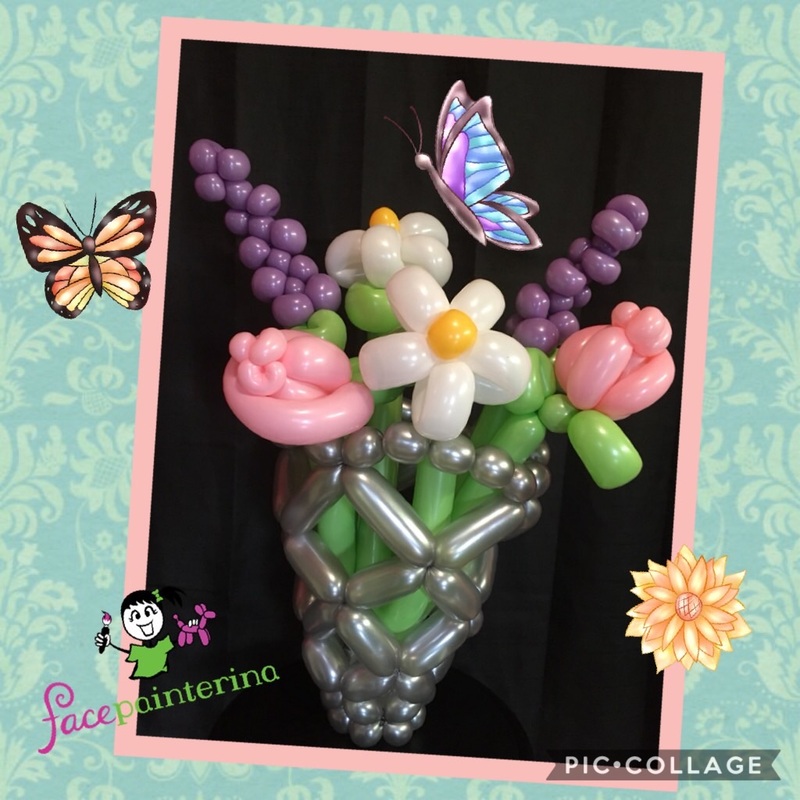 Live balloon twisting is perfect for restaurant family nights. 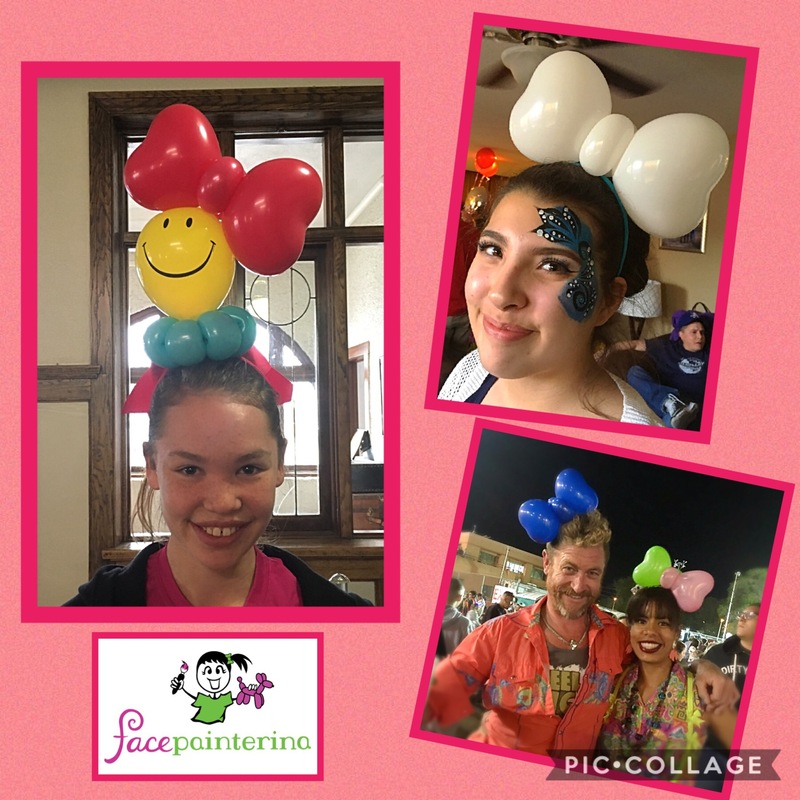 Whether it’s to boost a slow weekday night, build community, or for special events, hiring a professional balloon twister will draw a crowd and encourage repeat customers. 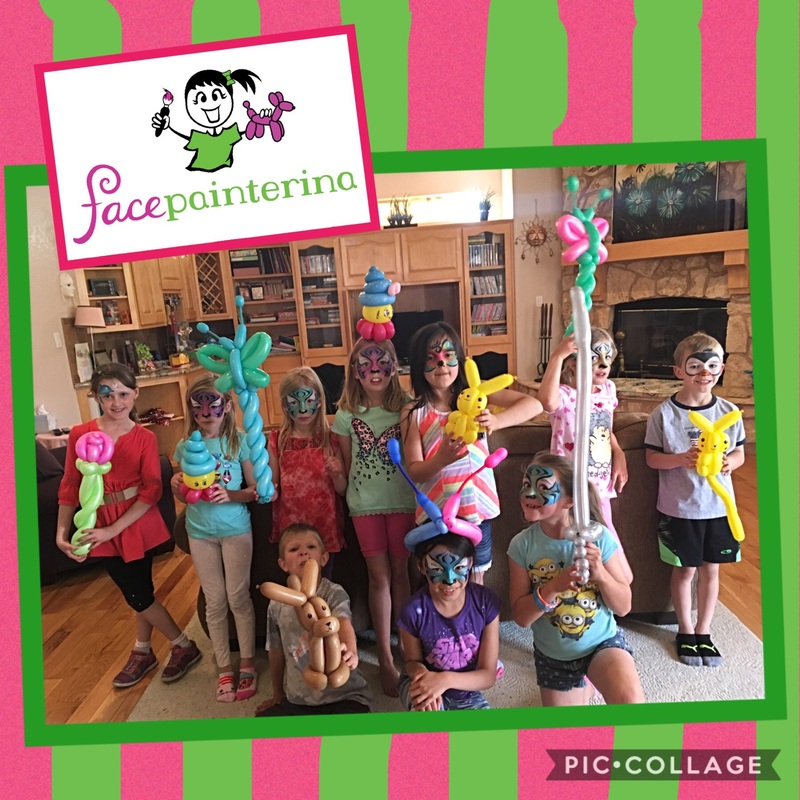 Add balloon twisting or balloon party favors to a face painting package for that extra wow factor! 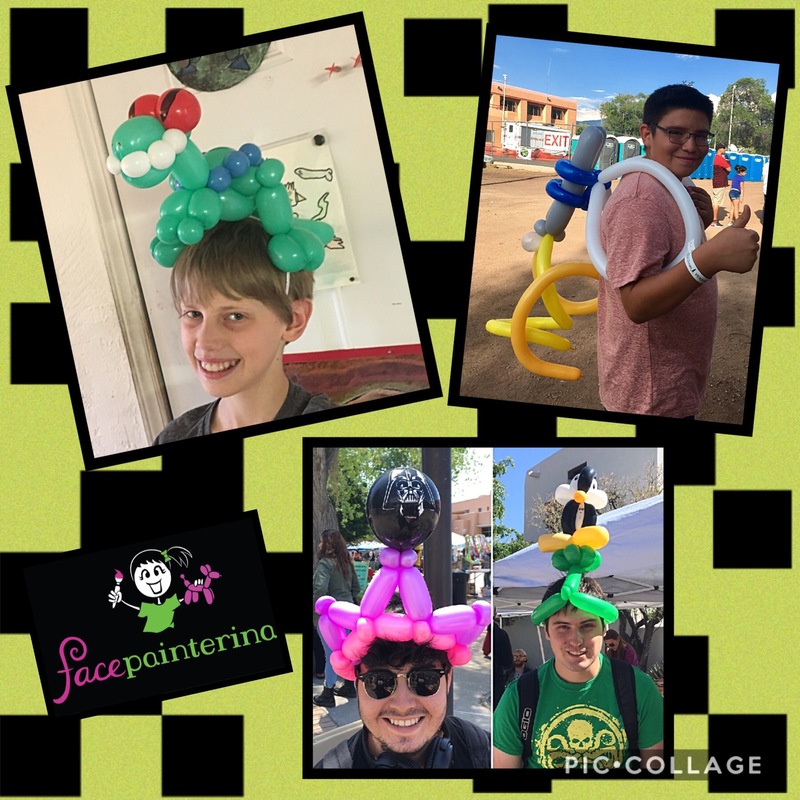 Adults love balloons too! 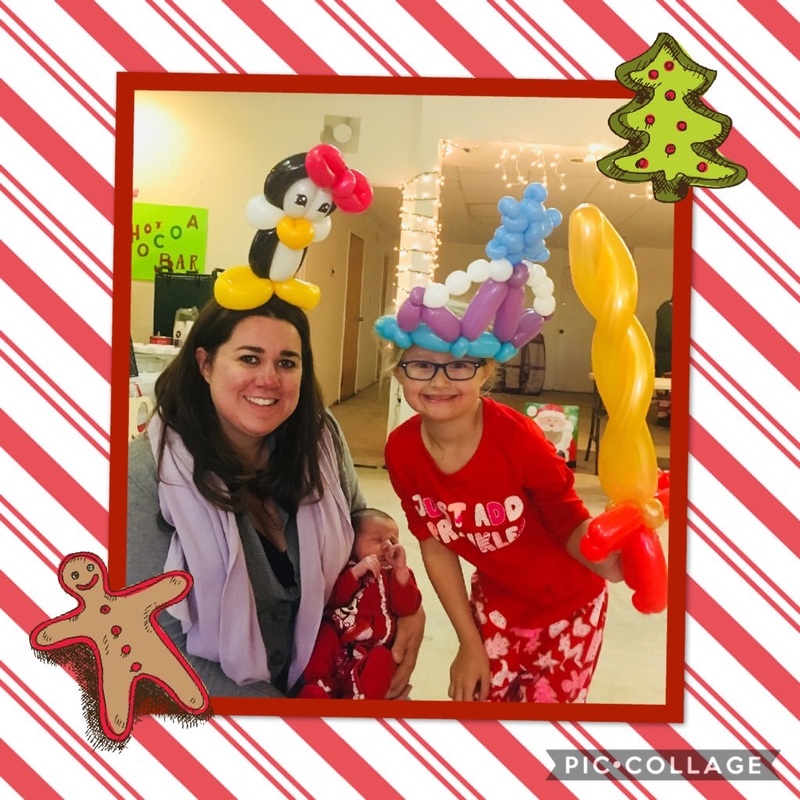 Wacky balloon hats are big hits at adult parties and events! 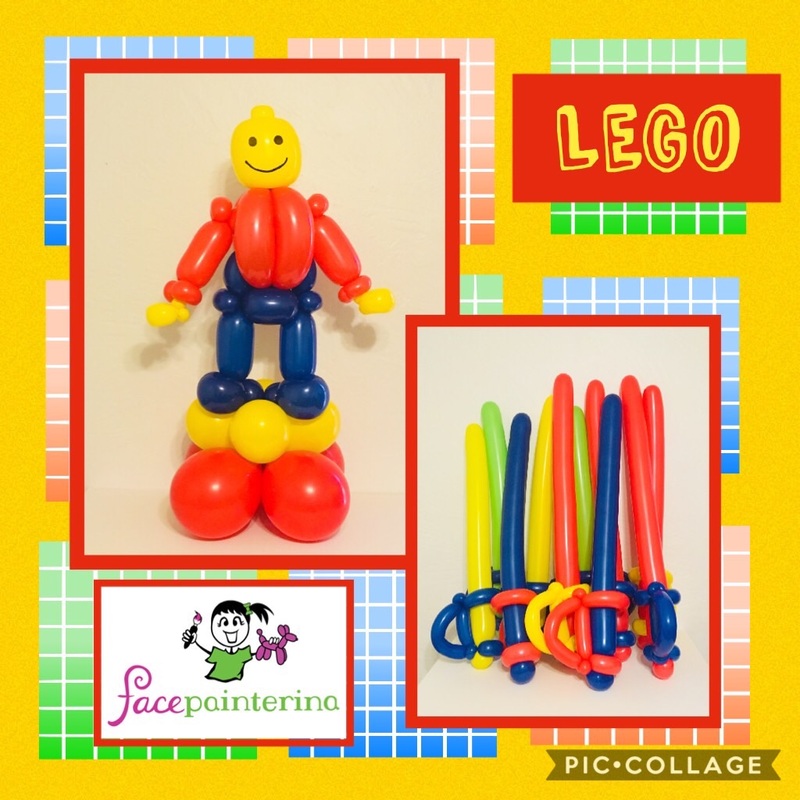 Spontaneous Epic Balloon Sword Battles may occur! Have your camera ready! Need a quirky gift? 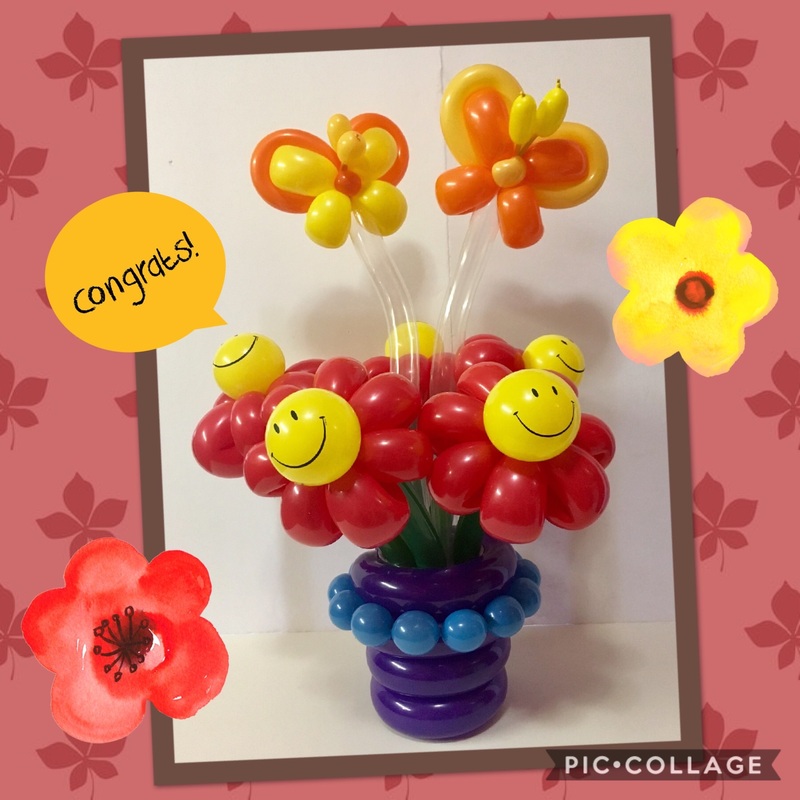 Balloon bouquets and floral arrangements are a great way to say, ‘I love you’, ‘Thank you’, ‘Happy Birthday’ and ‘Congratulations’! We’ve got roses, daisies, tulips, hyacinths, and more. 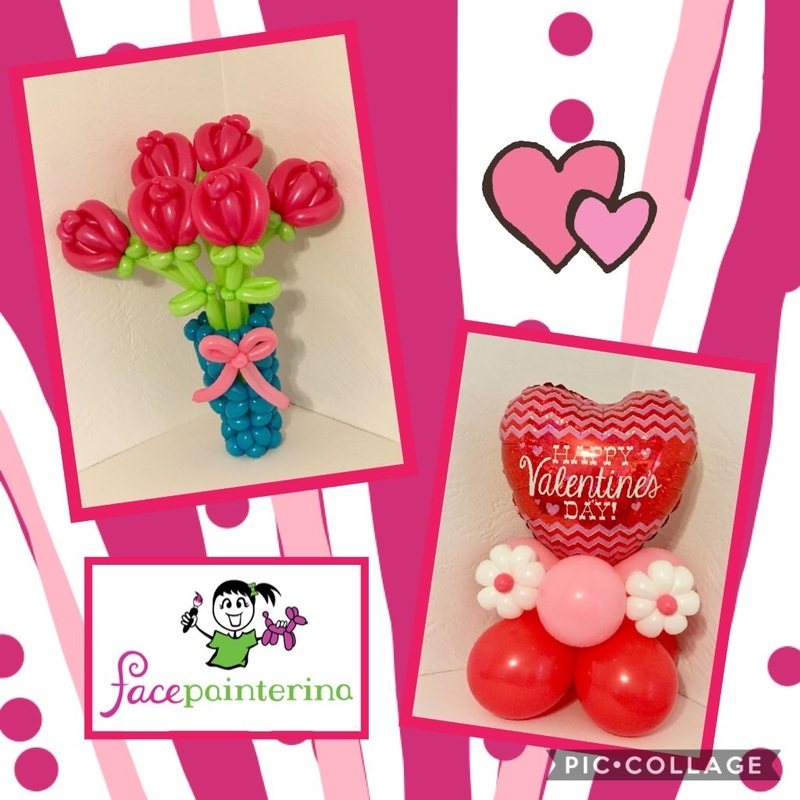 Have your balloon flowers wrapped with a bow or set in a lovely balloon vase or basket. Throw in a butterfly, bee, or puppy for extra cuteness! No water required! What does everyone want? Sugar and money! Forget boring, expensive cards that people don’t read and end up in the trash. 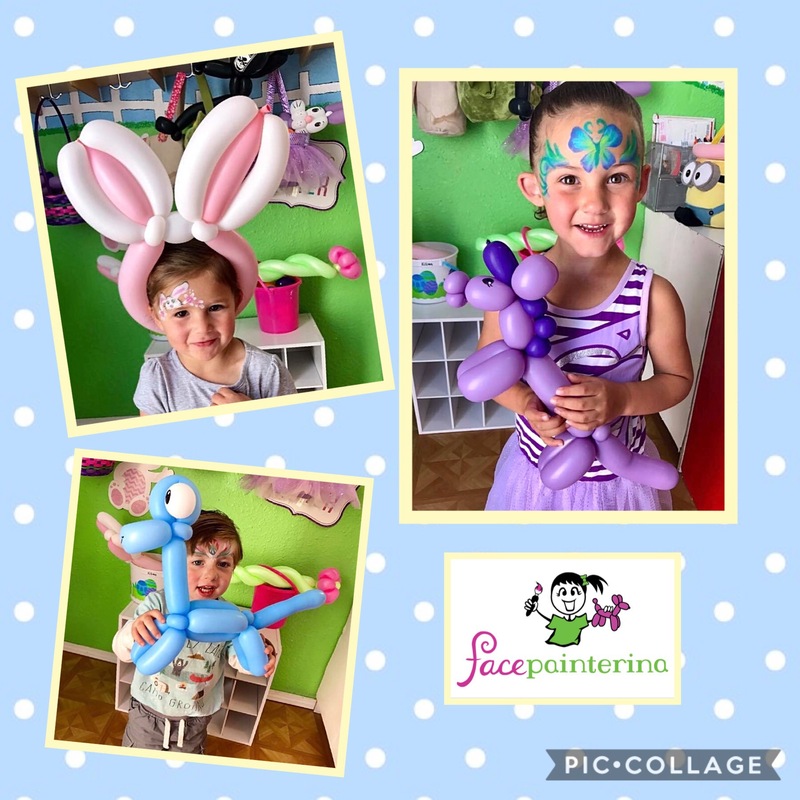 Instead give a balloon cup, a balloon creation attached to a cup…that can be stuffed! Pick a design, we make it, and you stuff it! Or let us stuff it to save time! 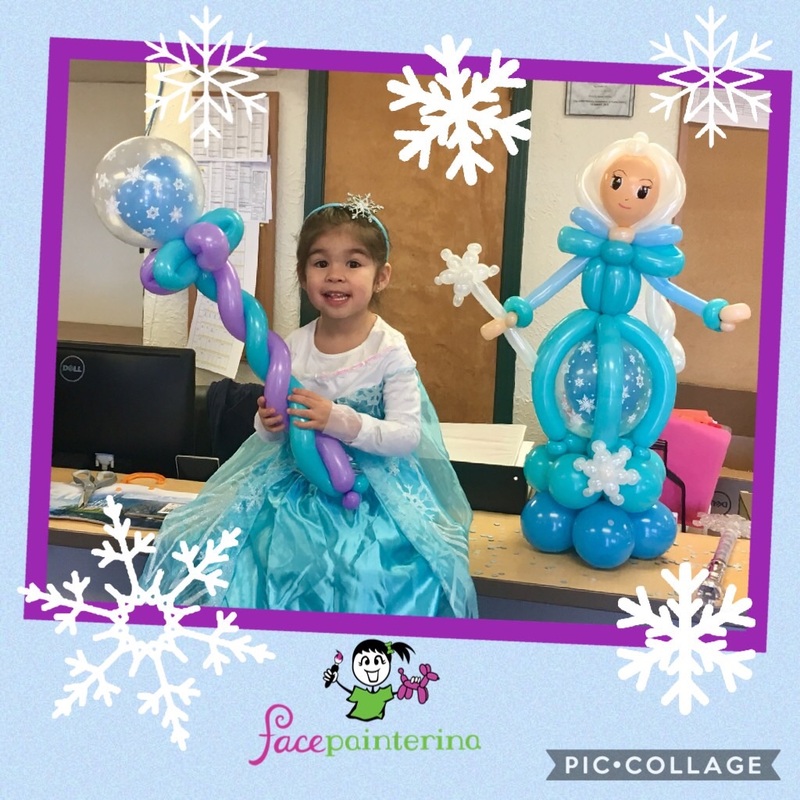 Our balloon designs can last for days sometimes weeks! 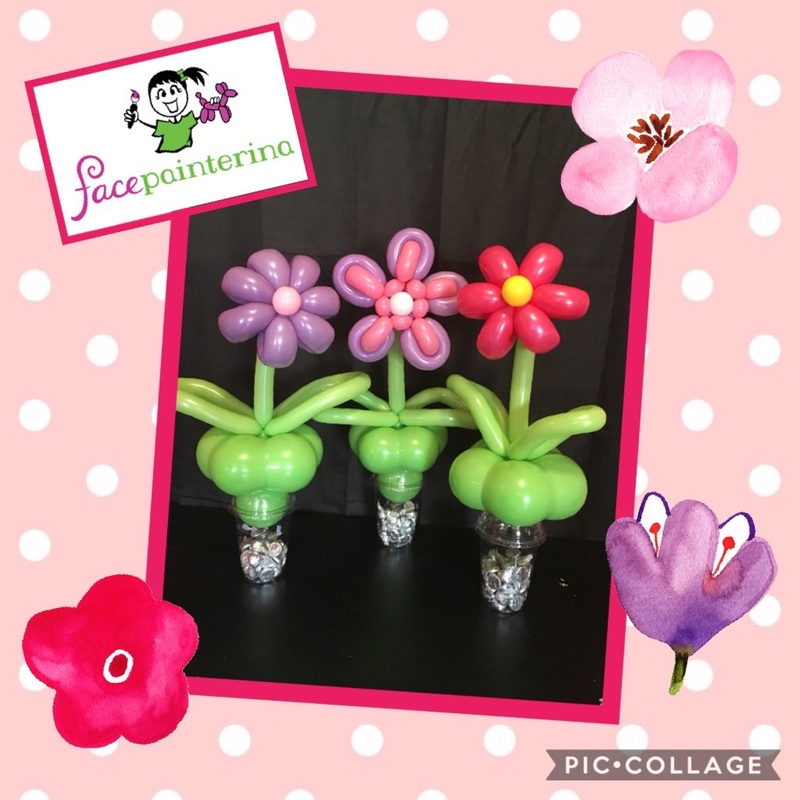 Balloon cups also make great party favors! Psst! 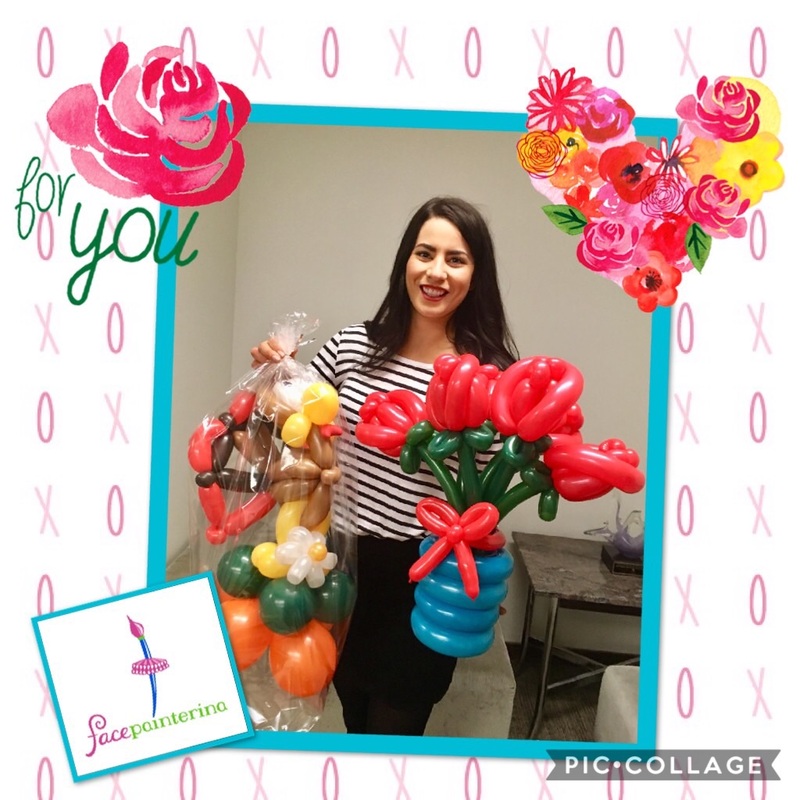 All of our balloons can be picked up or delivered. 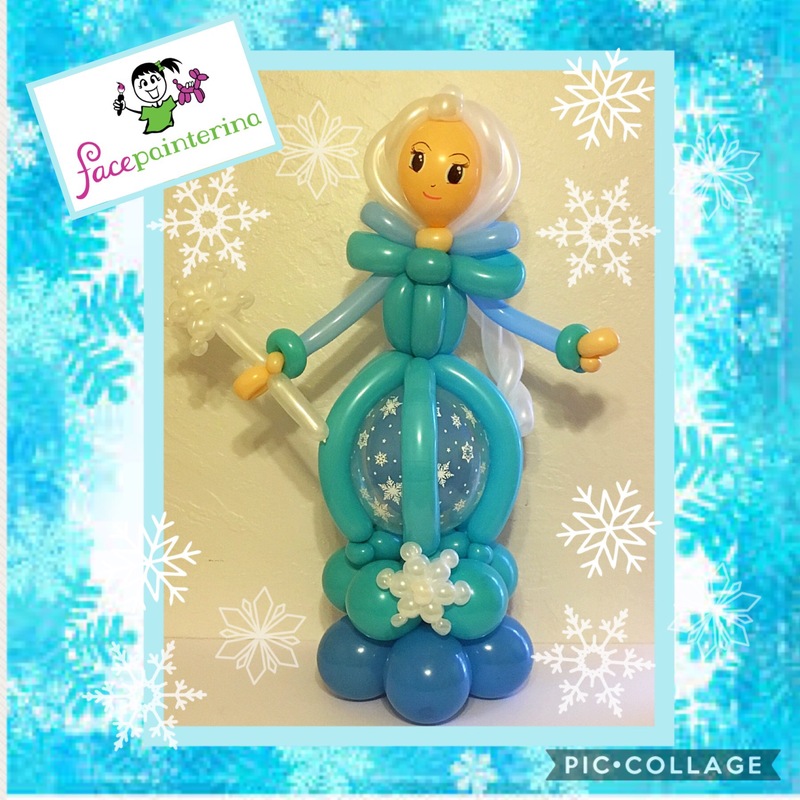 All balloon orders require a 3-5 days advanced notice. Tired of lame decor from the same party store? Can’t find anything for your theme? 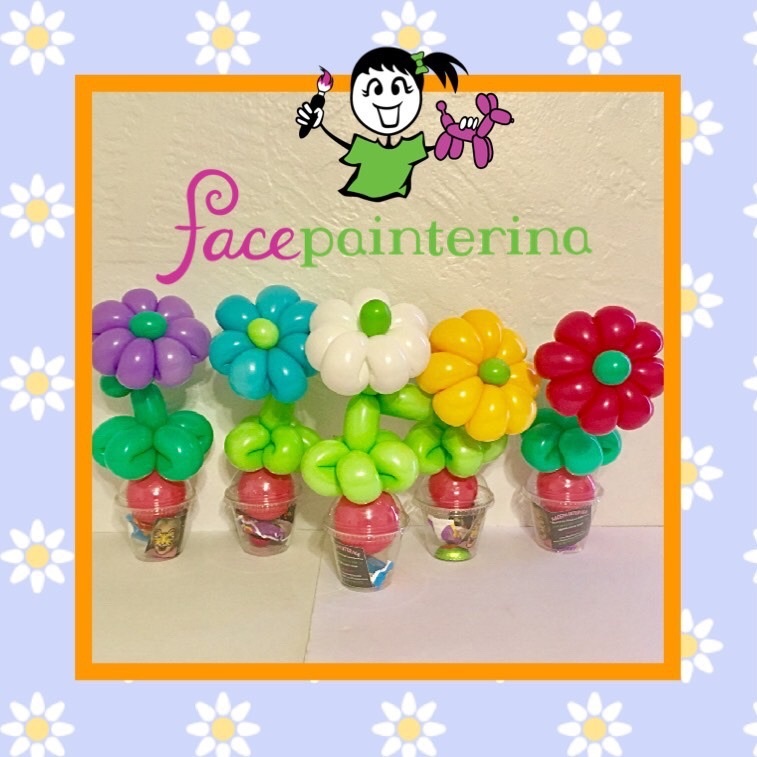 Let Facepainterina design eye-popping balloon decorations for your event. From cool foil toppers to elaborate twisted creations, we’ll blow your guests away with air-filled fun! Selfies are hot! 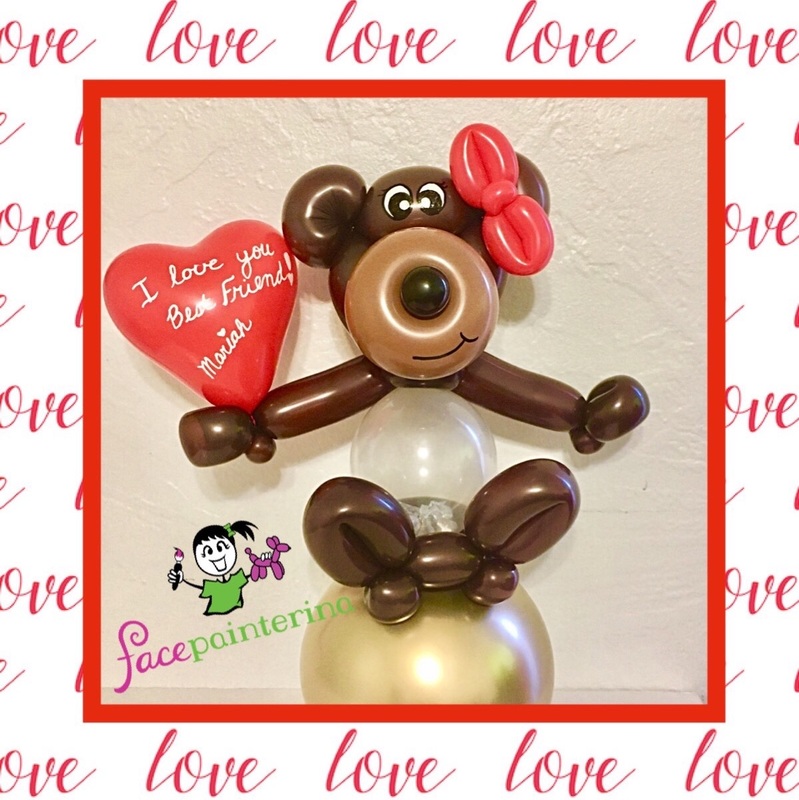 We create custom balloon photo frames of all shapes and sizes to match themes, holidays, and business brands. Try a hand held photo frame for fun selfies or a freestanding frame for group photos. 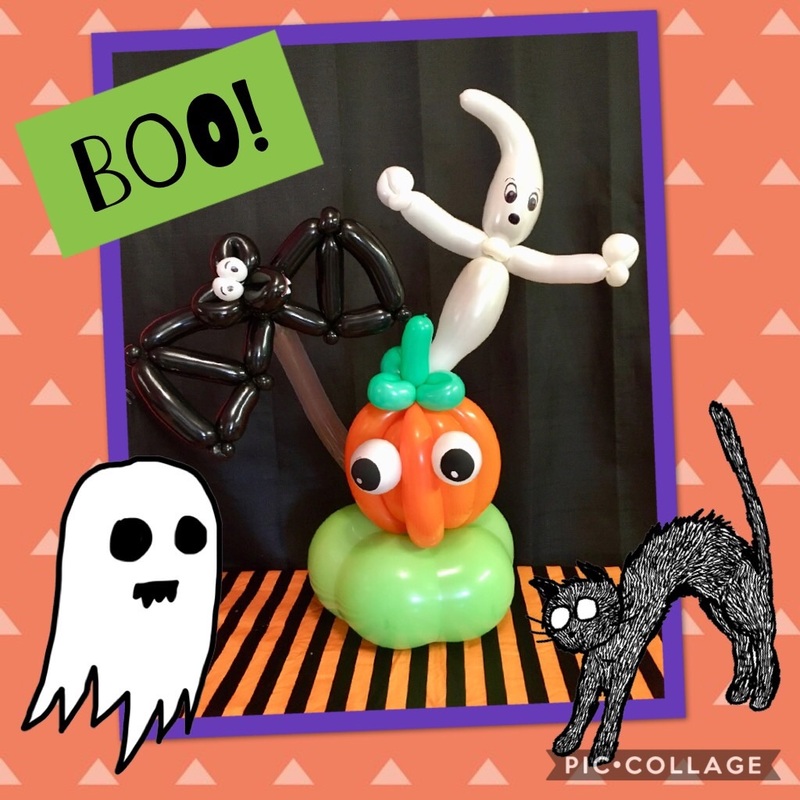 Take a picture with a balloon photo frame, it’ll last longer….and look cooler! Accent doorways, tables, stages, even thrones with balloon columns. You pick the colors and height, we build it! 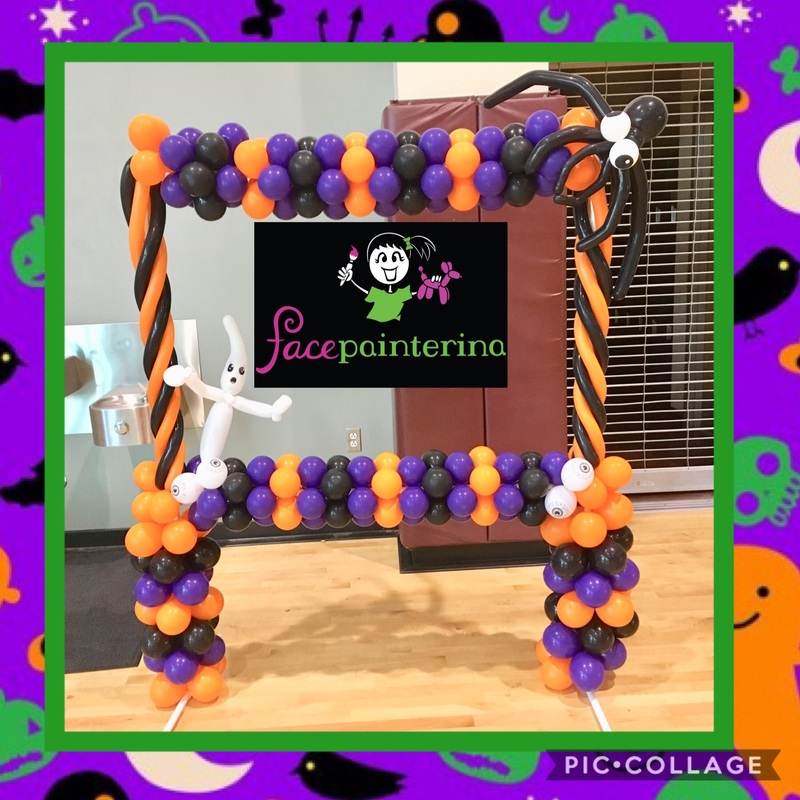 Balloon arches are perfect for entryway and table top decor. 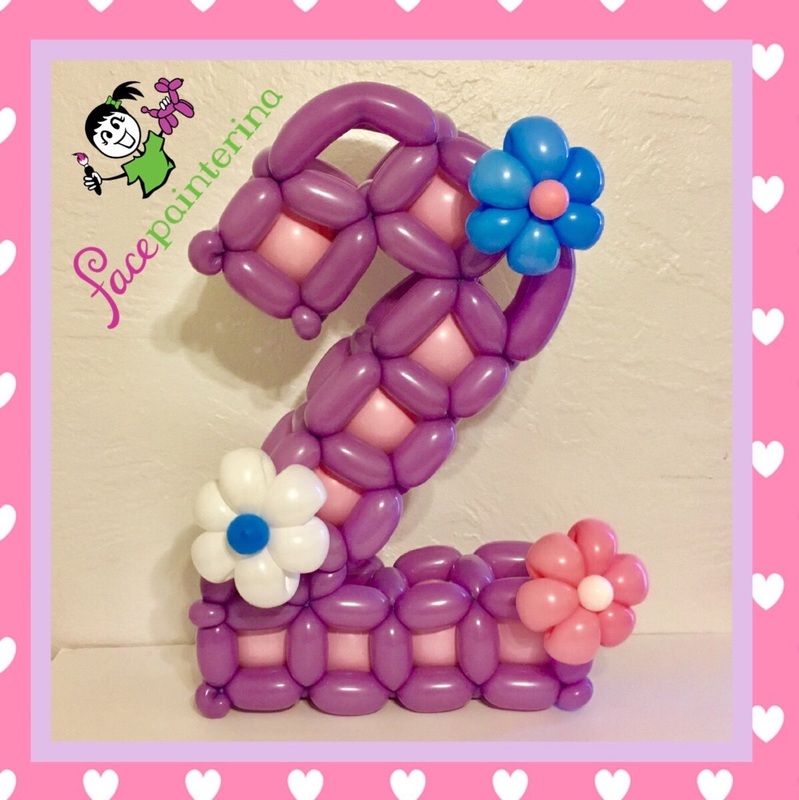 Stay tuned for some cool balloon arch pictures! 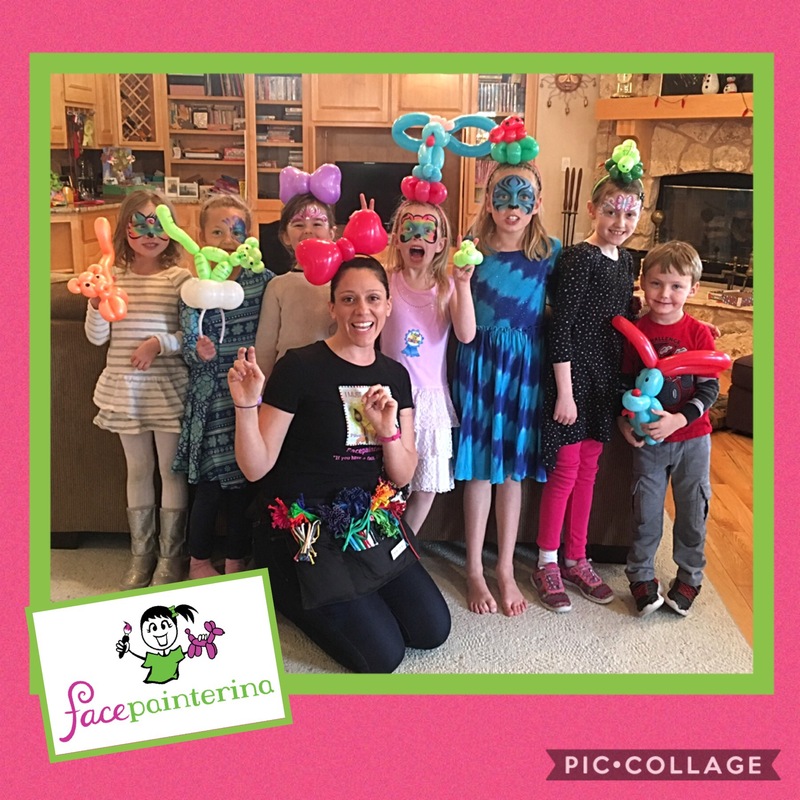 Facepainterina offers beginning and intermediate balloon twisting lessons for parties and group classes. She offers one time and ongoing classes. 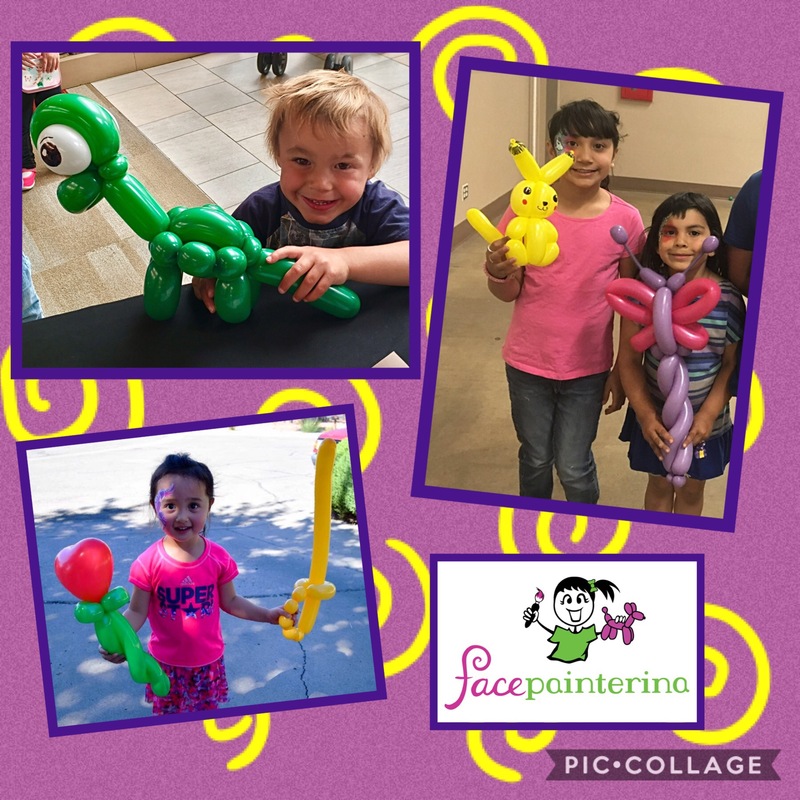 Balloon twisting is a creative way to teach kids pattern memorization, complimentary colors, problem solving, structure building, and helps develop fine and large motor skills. 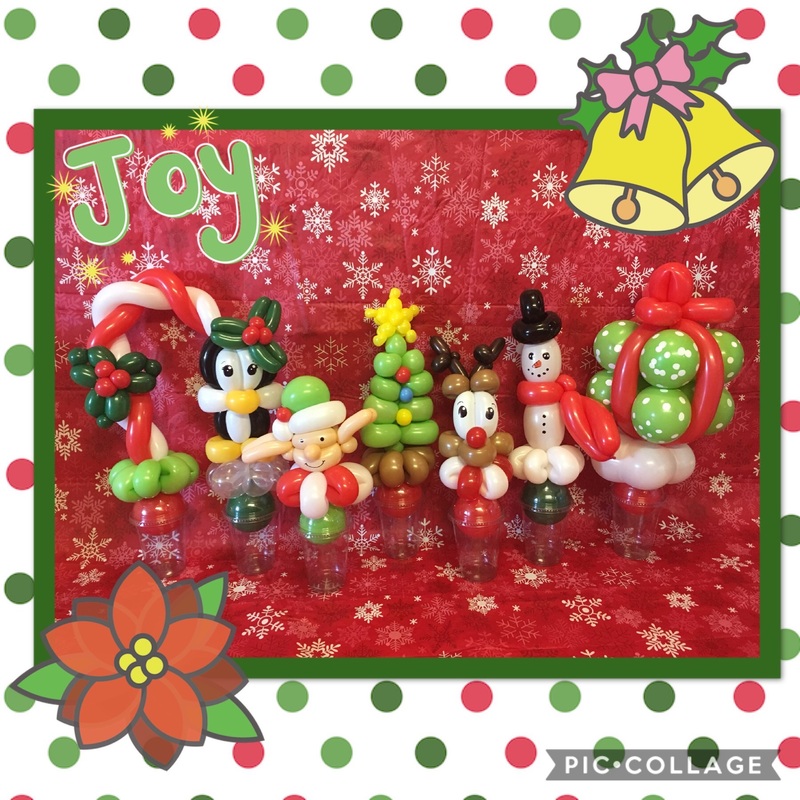 Our ongoing classes add a new twisting skill and/or design each class. 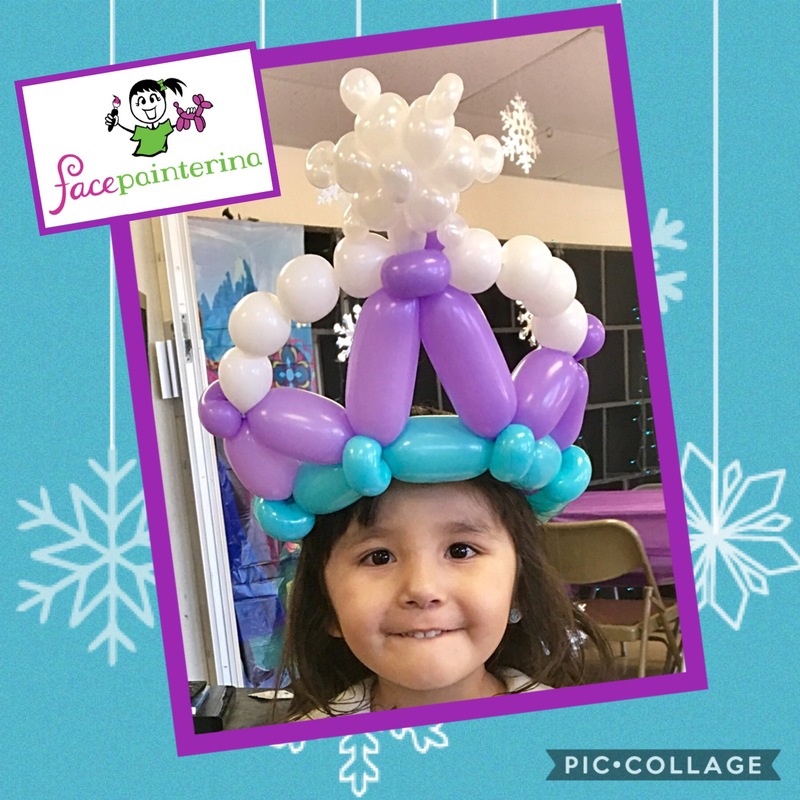 Some of the classes include balloon bridge or tower challenges to encourage kids to work together and think critically. Ask about discount prices for ongoing, weekday classes. 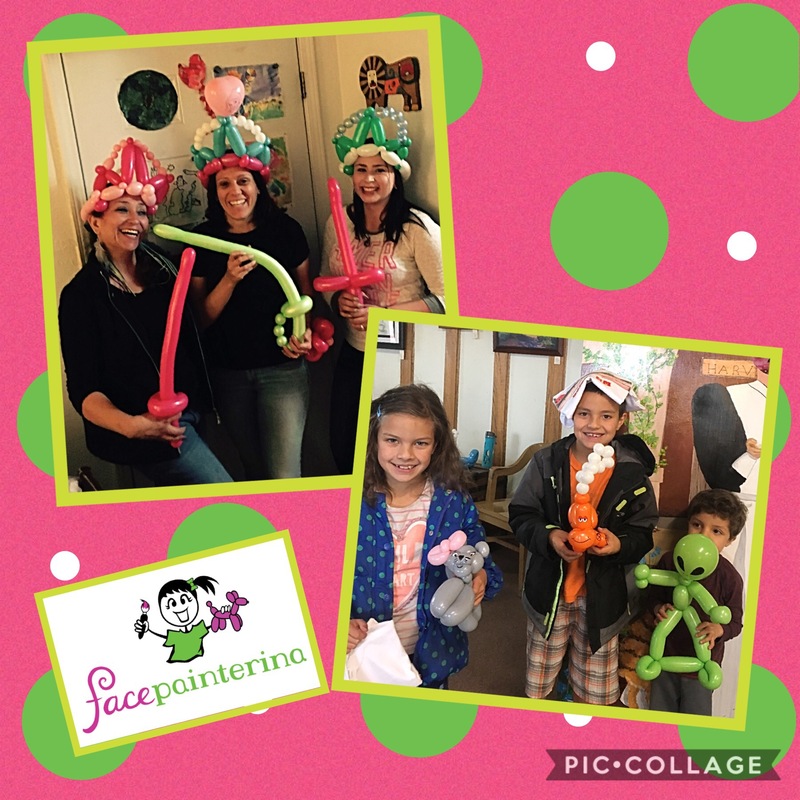 We provide the balloons, pumps, and instructor! Do it yourself parties are totally POPular! 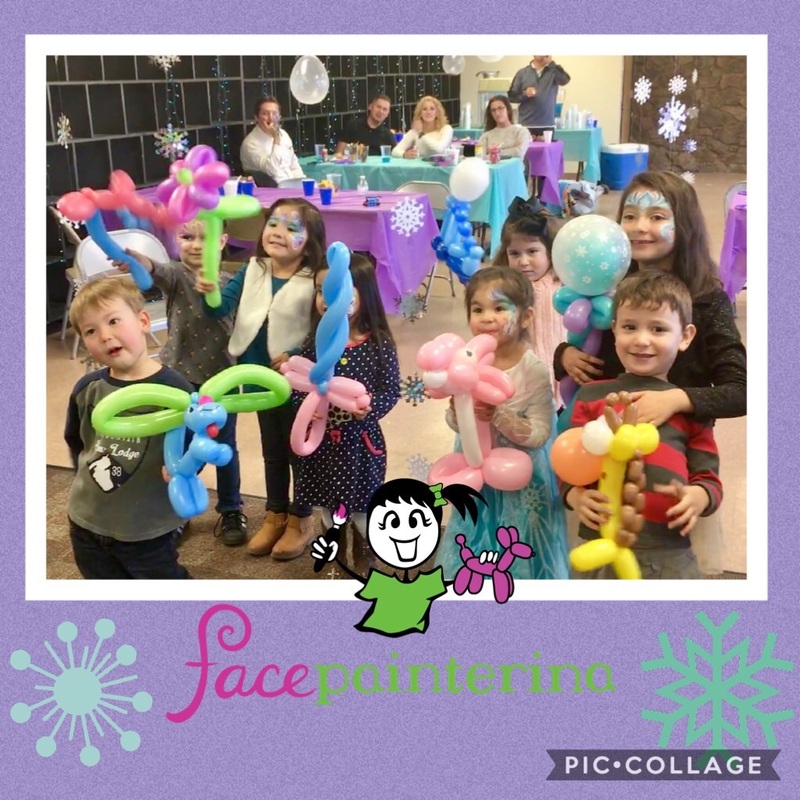 Book Facepainterina’s Balloon Class for your next party! 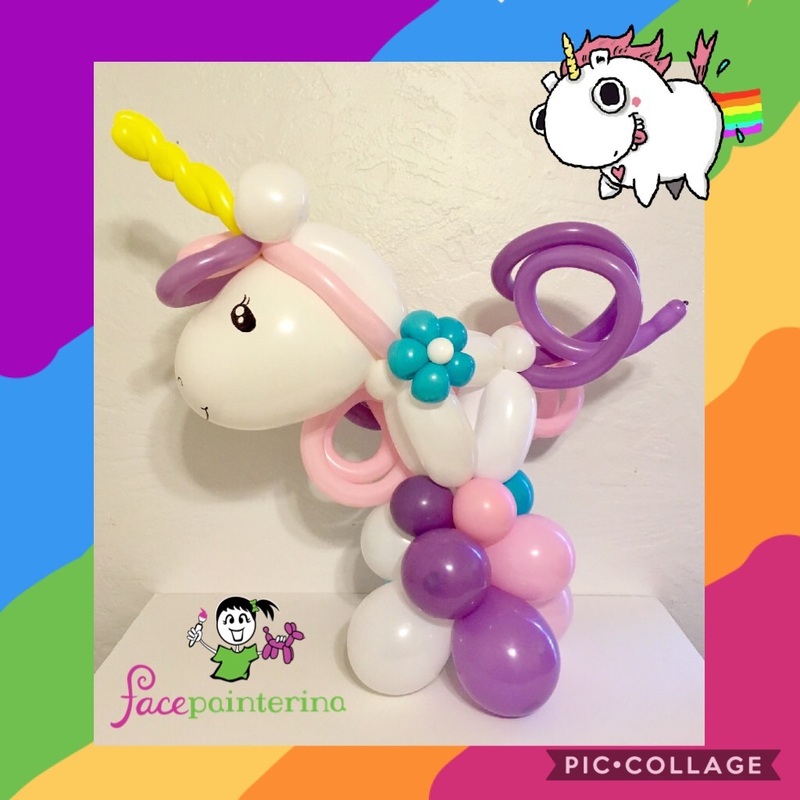 Your guests will learn beginning balloon twisting techniques and one balloon design. Each participant will receive one balloon pump, a bag of balloons, and practice sheet. 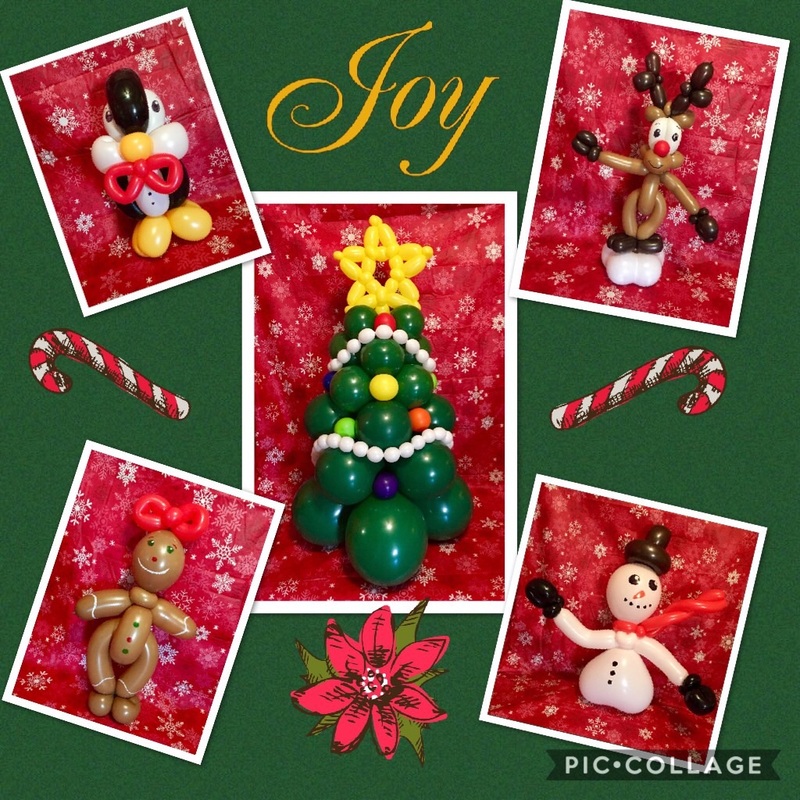 Check fun and goodie bags off your list! 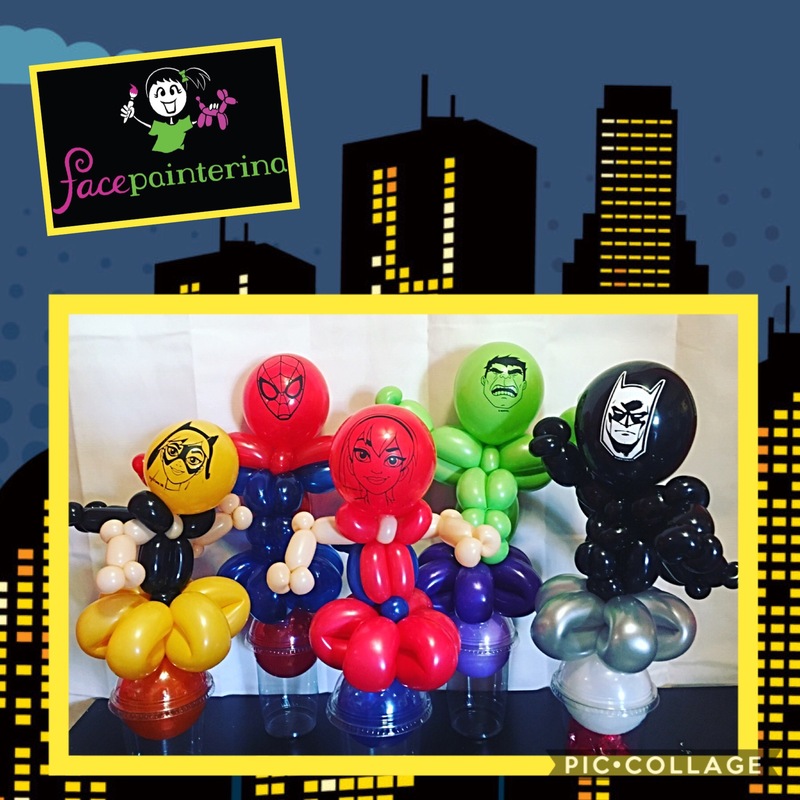 Would you like to become a balloon twister? 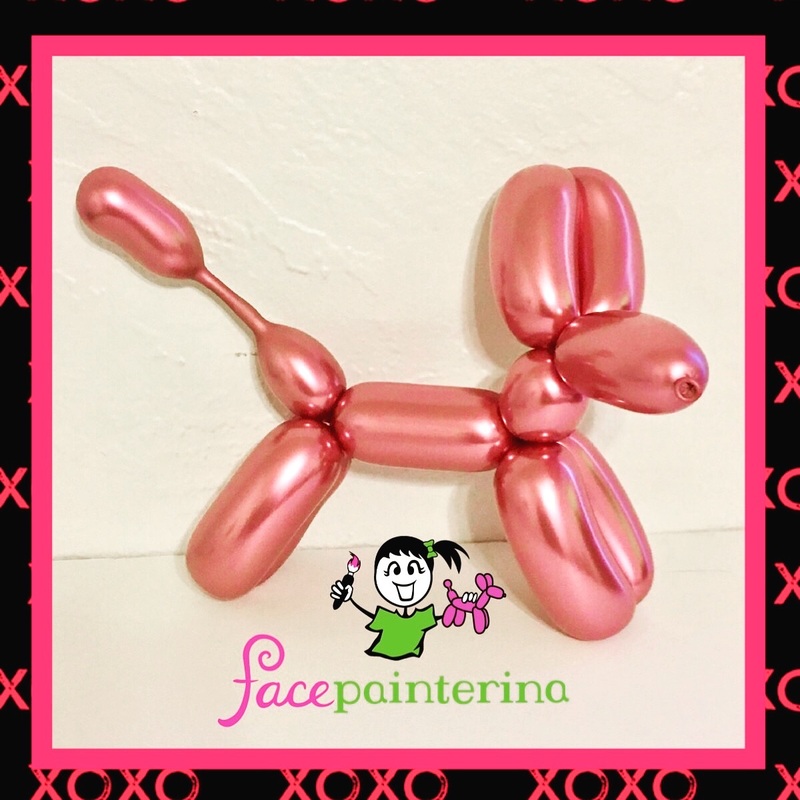 Follow us on Facebook for invites to monthly balloon jams hosted by Facepainterina. 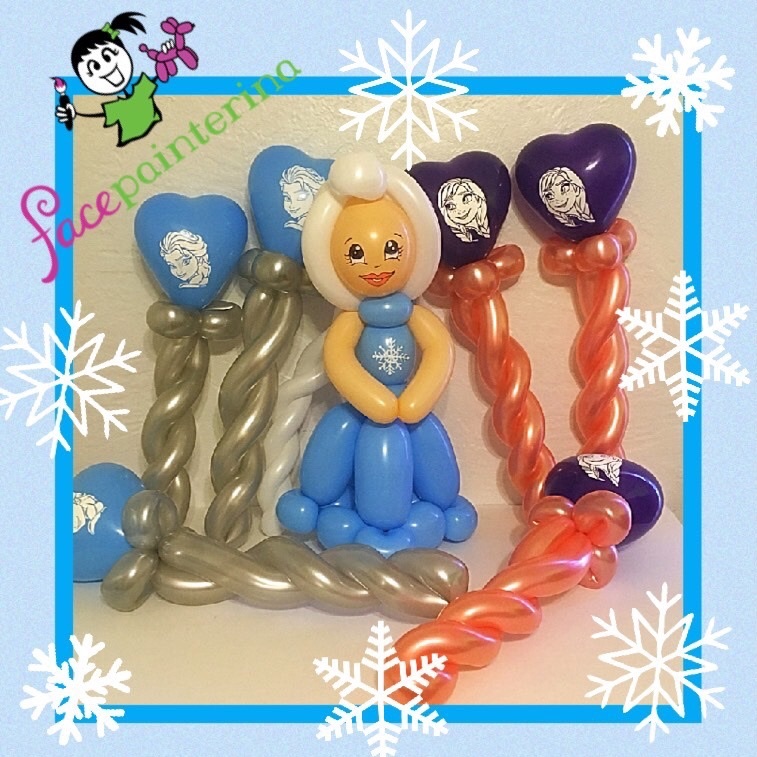 **Latex Balloon Warning: Latex balloons can pose a choking hazards to children 5 years old and younger and pets. Adult supervision is advised.